The Aktru Research Station belongs to the National Research Tomsk State University, Russia. The Aktru Research Station is located in the south-eastern part of the Altai Republic close to the borders to Mongolia and China in the centre of the Eurasian Continent (50°06’03” N, 87°40’14’’ E). With an altitude of 2150 m a.s.l., the station is situated in the high alpine part of the Altai Mountains. The nearest settlement is Kuray village about 30 km southeast of the station. The nearest town is Gorno-Altaisk, about 250 km northwest of the station. The Aktru Research Station is surrounded by a wide range of ecosystems changing with altitude: Kuray basin intermountain steppe, steppe belt on the mountain slopes, forest belt, high mountain belt with alpine landscapes and glaciers, high-mountain tundraA type of ecosystem in which tree growth is limited by low temperatures. The origin of the word is from from the Kildin Sami word tūndâr, meaning "uplands" or "treeless mountain tract". In the northern... More (“goltsy”) as well as cryophyte steppe landscapes. A typical high-mountain vegetation is the “Pseudo-tundra”, formed in the periphery of glacial fields under Pleistocene continental climateThe average weather we would expect over a long period of time (seasons, years, decades). Climate varies from place-to-place across the Earth. Climate is determined by long-term (over at least... More conditions. Some rare animal species reside in Aktru valley, e.g. snow leopards, wolverines, lynx, musk deer, mountain goats, cranes, and lama ducks. The Aktru Research Station was founded in 1956 by V.M. Tronov and has been in operation until today. From 1975 to 1995, a meteorological station was operated by the State Hydrometeorological Service. Since 2008 new buildings were constructed comprising a staff house, a dining room for 150 persons, a summer cafeteria for 30 persons, a diesel station as well as showers and toilets. The older buildings, recently renovated includes a ‘hospital’, classrooms, three apartments (housing c. 60 people), a warehouse, a Banya (Russian sauna), and a tent camp for 200 persons. The research at Aktru Research Station focuses on glaciologyThe study of glaciers., hydrologyThe study of water in the environment, particularly its amount, movement and quality. It encompasses water in rivers, lakes, glaciers, soil and underground aquifers. The way in which water (liquid and... More, meteorologyThe scientific study of the atmosphere and its phenomena, especially in relation to weather and weather forecasting.... More, geomorphology, ecologyThe study of living organisms in their environment, including where they are found and how they interact with their physical environment and with each other, for example through food webs.... More, botany, zoology, and soil science. The main aims are to study climate-driven glaciers dynamics, hydrological regimes, cryogenic processes, landscape patterns, and biotaIn simple terms, this word is a collective term for all living things. To refer only to animals, we use the word fauna, and for plants, flora. See also 'biodiversity'.... More. Different international projects investigate mountain mires in terms of climate-driven changes of landscape patterns, biogeochemistryThe study of the cycling of chemicals between organisms and the surface environment of the Earth. The Earth's surface environment is generally divided into four: the atmosphere (the gases around... More, and productivity. 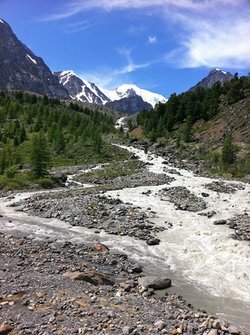 Kuray Basin, an inter-mountain depression, situated at the foot of the North-Chuya Range (10 km from Aktru Station) is a key site for studying the Altai mega floods. Existing databases contain records on climate, hydrology, and glacierA glacier is a large, persistent body of land-based ice that forms over many years where the accumulation of snow is greater than its loss (ablation). The ice in a... More dynamics as well as on plants and vegetation-cover ecology. The traditional Altai’s and Kazakh’s culture still plays a major role in the daily life of the region (nomadic animal husbandry, fishing, and hunting). Also ecological tourism, alpine tourism, and research are important for the local economy. The Aktru Research Station can be reached from Kuray village (30 km of bad road, four-wheel drive vehicles are strongly recommended and can be rented in Kuray village). The nearest airports are Barnaul (650 km), Tolmachevo in Novosibirsk (880 km), and Bogashevo in Tomsk (1150 km). All these airports are connected to Moscow by daily flights.